FRESHER FOOD - This generous 16 ounce 1 compartment bento lunch box keeps your food, fresher for longer. Storing food in separate containers keeps it fresher because it's air tight and cools and heats quicker than when packed in extra-large bulk containers. EASY OPEN LIDS - Ideal for kids lunch boxes, these one compartment bento boxes have easy to open lids that are just perfect for little hands. Easy open lids are also wonderful for when you take food to an older relative who may have arthritis in their hands and a hard time opening tight lids. FOOD GRADE PLASTIC - All of our lunch box containers are made with the highest quality food grade plastic, assuring you both safe storage and consumption of your food. BPA free, our sushi box style containers can be frozen, microwaved, and are dishwasher safe. HOT OR COLD - Our processes of high grade plastic injection molding allows you to freeze your food and then take it to work and throw it in the microwave for a hot lunch. Whether you're keeping your food hot or cold in our bento lunch box that sturdy plastic design is resistant to cracking or breaking. CONVENIENT TO USE - Quickly and easily store your leftovers in our bento style lunch box. Take them on the go, or use them to store you food. No matter how you use them, these boxes make your life easier! 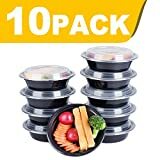 Paksh Novelty Meal Prep Lunch Containers 2-Compartment with Super Easy Open Lids - BPA-Free, Reusable, Microwavable - Bento Box Food Containers for Portion Control, and Leftovers (10 Pack), 30 ounces.